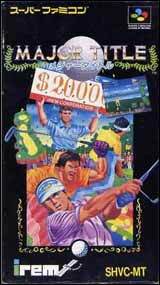 The Irem Skins Game for Super Nintendo is a playful little golf game where a golfer can use the swing meter represented by a long vertical bar that has a horizontal line moving up and down. After selecting your club, altering stance and determining power, simply press the button when the line reaches the target area to complete the swing. For 1-4 players.